A “Base and Insert” or “Shield and Liner” pad is a 2 part pad system where there is a “base” (usually a winged shape), that you place the absorbent part, an “insert” on top of. Which allows the absorbent part to be changed while leaving the base on. The “insert” part can be a contoured/oblong shaped insert or a rectangle of fabric that folds up. The inserts can be held in by “pocket ends”, where the insert is kept in place because the ends are tucked into little flap of fabric at the ends of the pad, or by “straps” where lengths of ribbon hold the inserts in place. Personally I feel the most practical way of making these is to have a waterproofed base of cotton backing, with PUL, topped with microfleece, with strap ends, and absorbent rectangle “trifold” (fold into 3) inserts. The base is then leakproof, and won’t absorb any blood that flows through the inserts, so it can be reused when the insert is changed. The strap ends allow for greater adjustability and can more easily handle 2 inserts than the pocket ends. Longer inserts can also be worn if needed. Where an “All-in-one” pad set would need to be at least 5 pads per girl/woman to be useful, a waterproofed base + insert style pad can allow the inserts to be changed frequently while the same base is worn, meaning less bases are required (2-3), which reduces the amount of waterproofing fabric (which is often expensive) needed. Which is why I believe waterproofed versions would be more practical, as they can be worn longer. A girl/woman could have 2 or 3 bases and about 6-8 inserts. So less of the more expensive waterproofing fabric is needed than in making a set of AIO pads. If the bases are made from non-absorbent fabrics they dry quickly. The inserts can be washed separately so they are faster drying, particularly if they are the trifold kind. 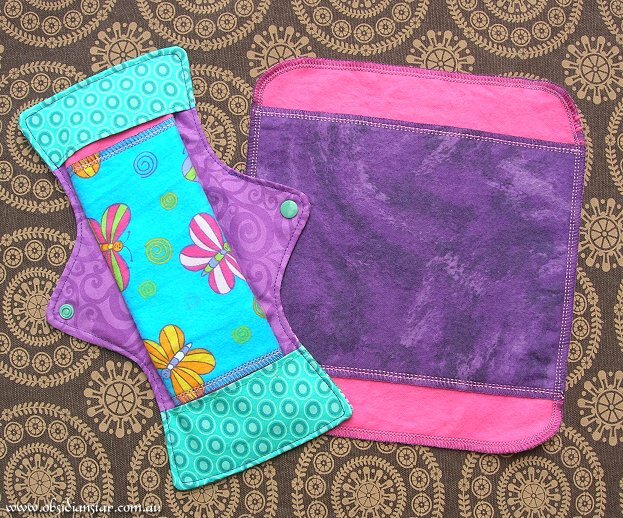 If extra absorbency is needed, 2 inserts can be worn at the same time, allowing a women to adjust the pad to her needs. If additional inserts are needed, other fabric sources may be available, such as old clothing, which would not make absorbent pads on their own without the waterproofed base. There are 2 main types of insert – a fold-up (“trifold” or “bifold”) or a “shaped” insert (which is the shape you need, with no folding). A “trifold” insert is one that is folded into 3 to be used. This is 3 times as wide as you want the crotch width to be, and the same length (or just a bit shorter if you’re using pocket ends) than the pad is long. You can combine several inserts to make up the absorbency you need, but as a guide making n insert from 2 layers flannel/flannelette becomes 6 layers when folded and would be suitable for regular flow. A “Bifold” is folded in half, so would be twice the width you need. This could be useful if you don’t need the thickness of 3 layers of fabric. 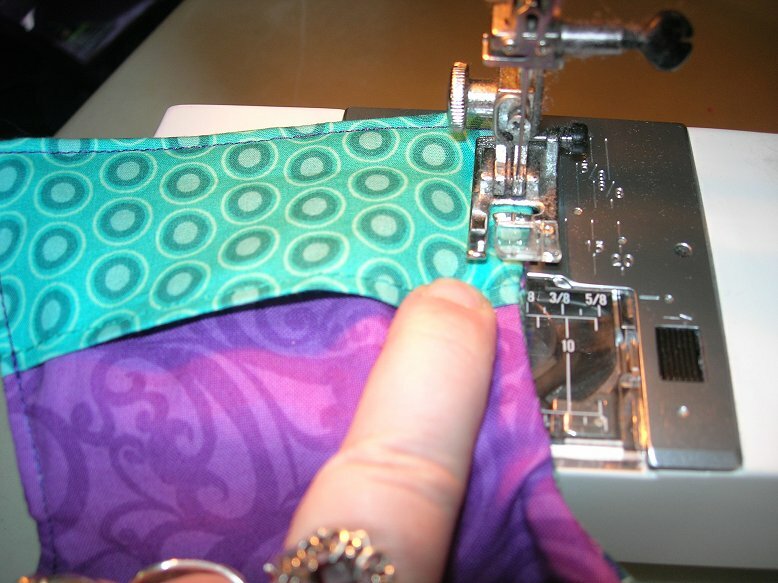 To make the ends of your inserts thinner (easier to stuff into the pocket ends), cut one layer (eg purple in the photo) a little shorter than the other (pink in the photo), then sew that smaller piece onto the larger one – then overlock/serge the edges. To make a shaped insert, make an oblong or contoured shape as long as (or just a little shorter) than the pad is. You can have a more curved shape with this design than the trifold will allow – meaning you can have a narrower crotch and flared ends to the pad. I normally make them by cutting 1 layer of bamboo or hemp fleece and laying that onto a roughly cut layer of flannel and overlocking around that. This makes a “light” absorbency insert, which can be layered together. I cut the end pockets in a square shape, fold it in half and sew along the fold to make the edge of the pocket. You can cut these out in the exact shape you need to waste less fabric. I have the placement of the pocket ends marked on my (clear plastic) template so I know where to place them. So I place the backing fabric down (good side up), then my pockets on top of this (folded/sewn edges inside the pad) – place my template on top and check the placement. Then the topper fabric (good side down). Pin around the edges and sew up. I leave the hole for turning in the wing because it makes a neater finish, however you can leave one of the pocket ends open and turn the pad that way. With the pocket on the wrong side of the pad, Zigzag the open edge, then turn the pocket over to hide the stitching. The top stitching will hide that zigzagged edge. I find this makes the ends a little bulkier though. When you are doing your topstitching, make sure you go over the edge of the pockets a few times to strengthen them. Also pull the fabric over (as you can see in the photo) – bringing the side of the pad a little towards the top (if that makes sense) to make the pocket gape open a little, which will give you a bit extra room in the pocket for the inserts. If sewing the pad up using an overlocker or serger, place the straps in the position you want and sew around the edge of the pad. Then using a sewing machine, sew over the straps inside the overlocking stitch to reinforce them so they won’t pull out or fray. If sewing the base in the “Turned and Topstitched” method, place your PUL layer down, then the backing fabric, then place the ribbon straps (good side down) (you might find it’s helpful to pin or stickytape the straps into place) then your topper layer. 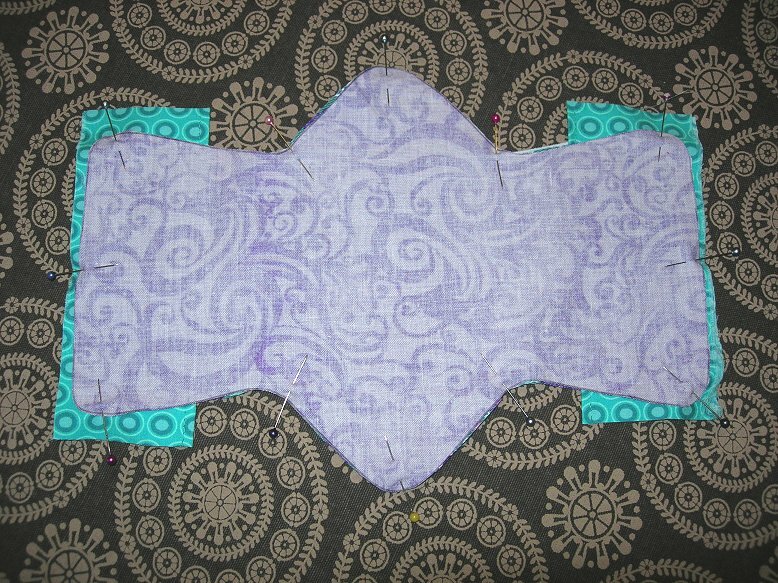 Sew around this as you would sew up any normal pad. When you turn the pad, make sure the straps are on the top layer of the pad. As you topstitch around the edge of the pad, you can pull the straps over a little (as done with the pockets above) to make them a little looser to give more space for the inserts. Also do a few stitches over the ribbon to help secure it.